Seventy percent of our planet is one connected ocean. It produces half the oxygen we breathe and feeds over three billion people. Today the ocean is at risk, losing biodiversity at an alarming rate due to pollution, overfishing, and climate change. The ocean’s temperatures greatly influence our planet’s climate, weather, fish stocks, bird populations. Ocean temperatures are steadily increasing yet our understanding of how they vary at the scale of the ecosystems is largely unknown to science. Only the power of citizen science and crowdsourcing can “plug this hole” in our understanding of how temperature varies in the ocean. Without this knowledge, the management and conservation of marine ecosystems is a “shot in the dark”. It is a vital source of information that governments, scientists, fisheries, and conservation organizations need if they are going to understand this major threat to ocean life. Project Hermes is the first global effort to measure ocean temperatures worldwide at the scale of the ecosystem. Since August 2015, Cousteau Divers spearheads this unique project. Using satellite sea surface temperature, diver’s computers and a collaborative, non-profit, open source software and database, Project Hermes will provide near real-time temperatures of the ocean, at depth, world-wide. Every time the Cousteau diver enters the underwater realm, they provide vital data on how ocean temperature varies. This is revolutionary information. The Cousteau Divers community started six years ago, to act as an immune system for the ocean seeking to better understanding it and better protect it. Check out what we’ve been doing up to now on http://www.cousteaudivers.org/science and http://www.cousteaudivers.org/multimedia/all. Our website is being improved and the new version will go live in October 2015. Our rapidly-growing community will soon consist of 50 Cousteau Dive centres in over 15 countries in Europe, the Middle East, Asia and the Americas. We have gathered thousands of images of marine life world-wide and an online community hundreds of thousands strong. Join our online community of over 130 thousand likes on www.facebook.com/cousteaudivers. In July of this year, during the World Ocean Summit in Lisbon, Cousteau Divers met with Professor Ove Hoegh-Guldberg, Director of the Global Change Institute of Queensland (GCI), a world-class research organisation dedicated to solving the mysteries of the ocean, especially in the light of the rapid changes that are now occurring due to climate change. Speaking about the power of citizen science, we quickly realised what we had in our hands. Combining the Cousteau Divers community and reach to UQ’s scientific network and connections with Coral Reef Watch at NOAA, we can take the temperature of the ocean. Literally. NOAA’s Coral Reef Watch uses some of the most advanced technology in the world to monitor the sea surface temperatures from satellites. DAN Europe’s Diving Safety Laboratory is the leading diver safety research organisation in Europe and has been collecting diving temperatures for a decade, with over 60,000 diver data profiles in stock. This data will be anonymously fed into the Hermes software to obtain a 10-year backlog of sea temperatures. We want to present these findings in time for the United Nations Climate Summit (COP21) in Paris, this December, where the leaders of the world will gather. We will shed new light on the ocean influences climate, which governments have not been privy to in the past. All of these partners, and more, are helping us make Project Hermes a reality with in-kind contributions. All data collected and processed is made open source and shared among all project partners and the public. Together we will organise a hackathon in October to explore programming solutions and the practical applications of this new data. We are non-profit, non-governmental, and open-source. We believe mankind needs this information in order to better manage its resources, and we have found a way of making it technically and financially possible, today. Textbooks will be re-written once we understand the behaviour of the ocean beneath its surface. Our target is to raise a minimum of USD 50,000 in order to purchase and deploy scientific equipment throughout the Cousteau Dive centres, making each Cousteau Diver a citizen scientist and ambassador of the project. We want to deploy 50 high-precision temperature loggers in dive centres world-wide to monitor the ocean in “near” real-time. The Hermes software will “bridge” the diver temperatures with satellite readings, and produce visual products accessible to all. Join us on this adventure and help us spread the word! 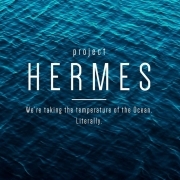 Marine life is in danger; with Project Hermes, become a steward of the ocean. Donating today to the pre-crowdfunding campaign will significantly help boost our crowdfunding campaign (which launches at the end of August 2015), as all funds collected will be deposited into the campaign on the day it launches. All donations received before the official launch of the campaign will be rewarded! We’ll put your name forward as an early donor and ambassador of Project Hermes. 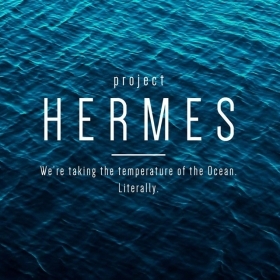 Thank you for actively supporting Project Hermes to take the temperature of the ocean in a way that has never been done before. Literally. Many thanks from our partners as well, including the beautiful and fragile beings in the ocean who sustain our very lives. Our fates are connected!